More gushing praise for a Boulder Canyon bag design coming up. The silvery grey of this bag is not just a perfect match for the flavor within, but it stands out brilliantly on the shelves alongside its flavor colleagues. The red logo, although much smaller than their previous packaging, pops brilliantly against the muted colored background. Not as thick as many Kettle Cooked Chips, but the bubbles and texture meant there were some extra large and particularly crunchy Chips. The snap was more brittle than with some, and the overall view was that of a crisp crunch rather than a hard, solid crunch. 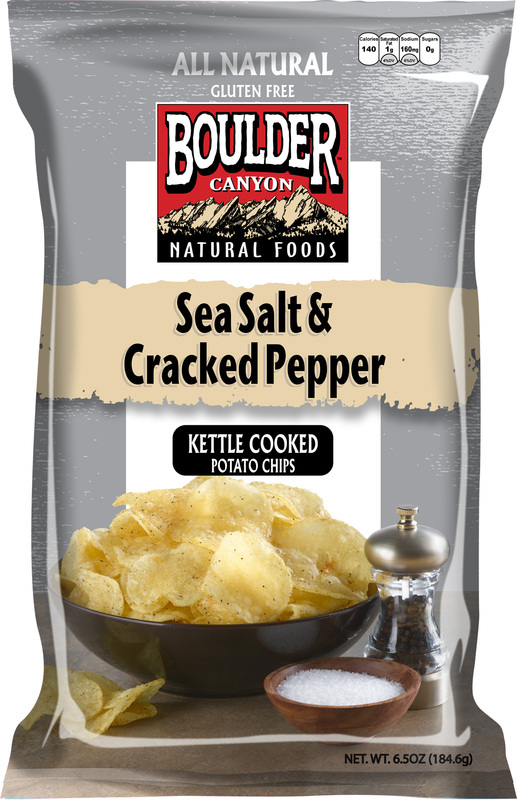 There were clear salty and peppery flecks throughout the bag. The Chips were mostly whole, irregularly shaped and large. There were some small and relatively curly ones, but the oil was muted and the bubbles on the surface of the Chips did not overwhelm any that we tasted. The aroma when opening the bag was of potato, nothing more nothing less. The taste altered as we munched our way through the bag consumption process. At first there didn't seem to be much flavor at all, but a few Chips in and the peppery flavor came through. Halfway through the bowl and the taste balanced. It was a good and well balanced combination of what would normally be considered relatively plain flavors.